In this survey I found that many of the careers that would make sense for me as a person are human centered, be it a doctor or a psychologist I would be most successful interacting with people. Realistic, social, and artistic are the three things I relate to most. 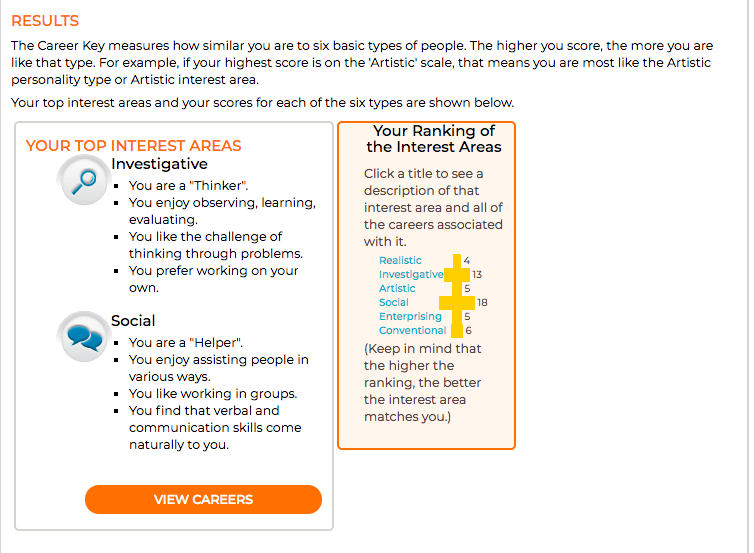 I think the results I got are relatable and make sense for me as a person, it confirmed that an interactive and social job would be a good fit for me. I don't agree with the fact that it said that I like working on my own, I know as a person I work a lot better with a group or in a team environment. I was surprised to see that I was both investigative and social, in the descriptions of both of them they contradict each other entirely, which doesn't line up with my personality. 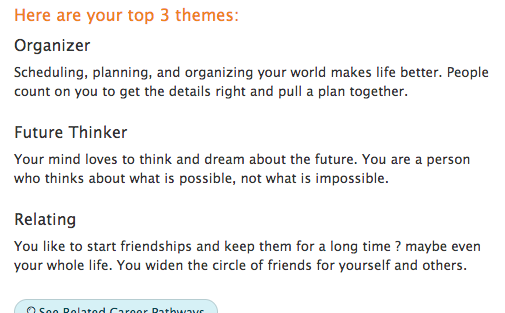 I'll keep in mind that my idea of a good career lines up with my survey results! I think this survey accurately describes some of my strengths and it also connects well with the first survey I took. I feel that the results are an accurate reflection of me as a person, both professionally and personally. I confirmed that I am social(relating), and that I am good with organization. I'm not sure that theres anything I fully disagree with in this survey, and more that the descriptions of each of the themes aren't always accurate or correlate to my descriptions of them. I was surprised to see that there was a mix of organized and "dreamer", I feel like this is a contradictory combination. I'll use this information to recognize some of my personal strengths.